Wayne Goss has released a new version of the Limited Edition Air-brush, this one has a rose gold ferrule with a light pink handle, the lettering is dark red brown, combines beautifully with this handle color, unlike some baby pink handles that may look sometimes a bit too girly, this is very pretty and elegant. 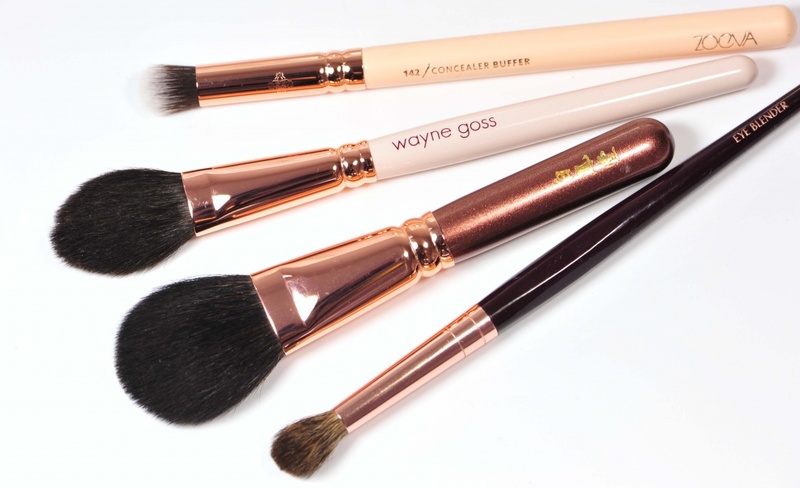 What I love about this brush is the tapered shape and the layering of the bristles on each side, this layering gives the brush more surface to work with, even if it’s super soft, it’s still functional and versatile. 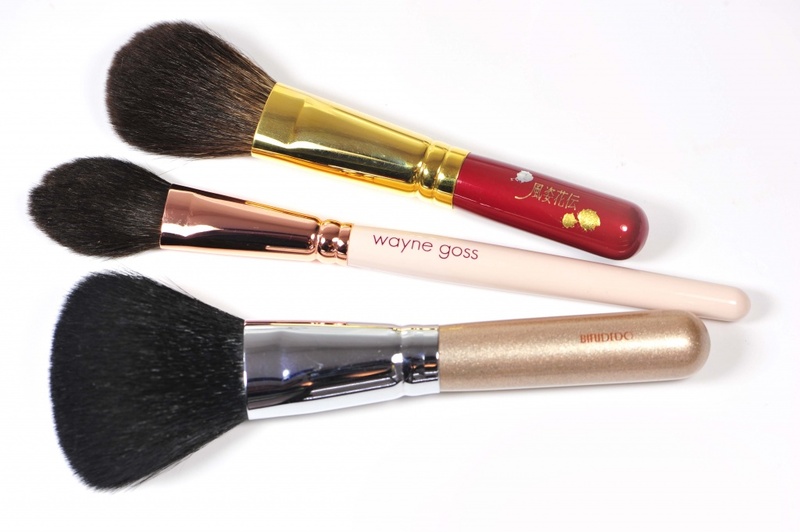 This brush is bundled with squirrel bristles, I use this brush mostly for blush and highlight, it offers great precision and a light to medium application -depending on the pigmentation and texture of the product. I don’t often set my makeup but when I do, this is a wonderful little brush to do it for me because I have very dry skin, when I set my makeup, my skin is almost already set so there isn’t much moisture residue or oils that are transferred onto the bristles, if your skin is very oily I’d rather recommend you to set your make-up with a goat bristle alternative, it will be both better for the bristles and better for setting capabilities. My post today is only to show you how it looks, my thoughts remain the same as with the original LE black handled Air-Brush, you can refer to this post if you would like to know more and see many more pics. The price is amazing, it’s the best value you can find actually, 40 $ and extremely worth it. 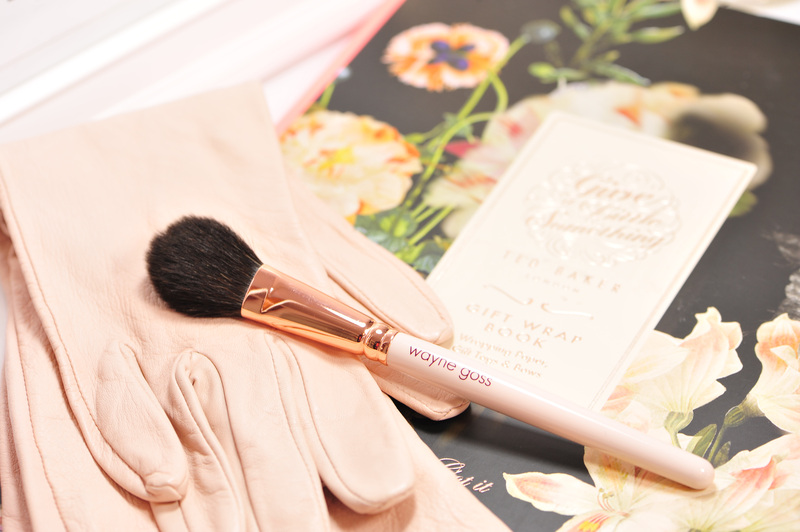 I am not a huge fan of yellow gold ferrules, sometimes it pairs well with some handles but given the choice I’d rather pick black ferrules; the rose gold ferrule on this Wayne Goss Air-Brush does look very good though and I do love it. The difference is really striking when put side by side. The Hakuhodo K 001 (38$) is blue squirrel mixed with horse. Just so you know, they add horse for several reasons, to give it more strength and make it more durable, they use less squirrel bristles, as a result, they price should always in theory be lower when comparing similar brushes. 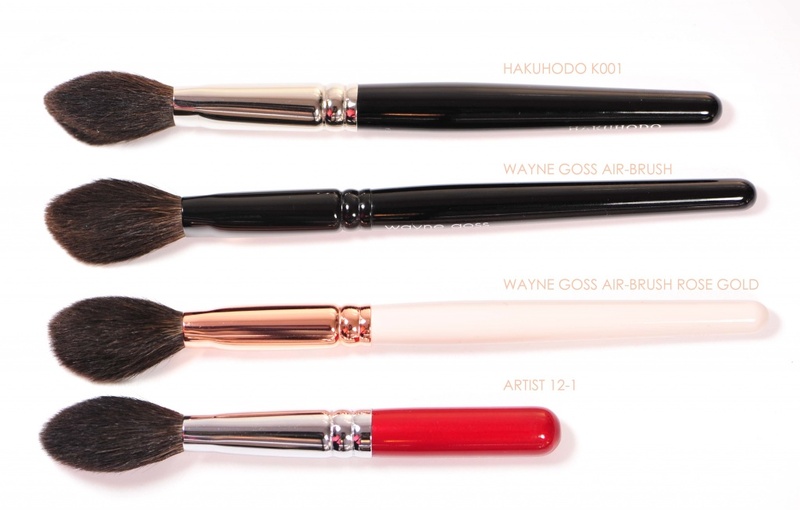 Chikuhodo stopped producing the Artist series, even though I am sure they will come up with series that are just as good, I feel a bit sad these are not sold anymore. They had either short handles or normal handles, the short versions were extremely handy for travelling as they have the exact same heads as the full size ones. 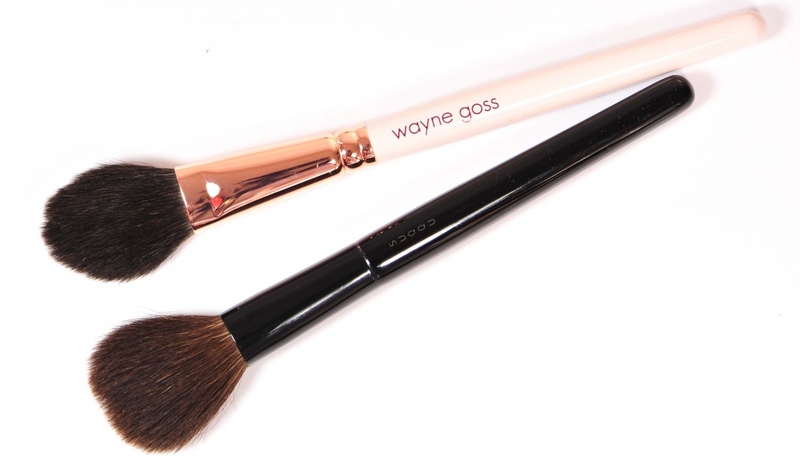 Compared to the Suqqu Cheek, in terms of softness the Suqqu does feel softer but the price is more than double, if you are on a budget and you still want to own something extremely wonderful, the Wayne Goss is an excellent option. The Suqqu is fluffier and will cover a bigger surface. There are series from Zoeva called “Rose Golden”, a bit darker, I think it’s the only ones that I have with a “Rose Goldx” name so I wanted to show you how different it was. 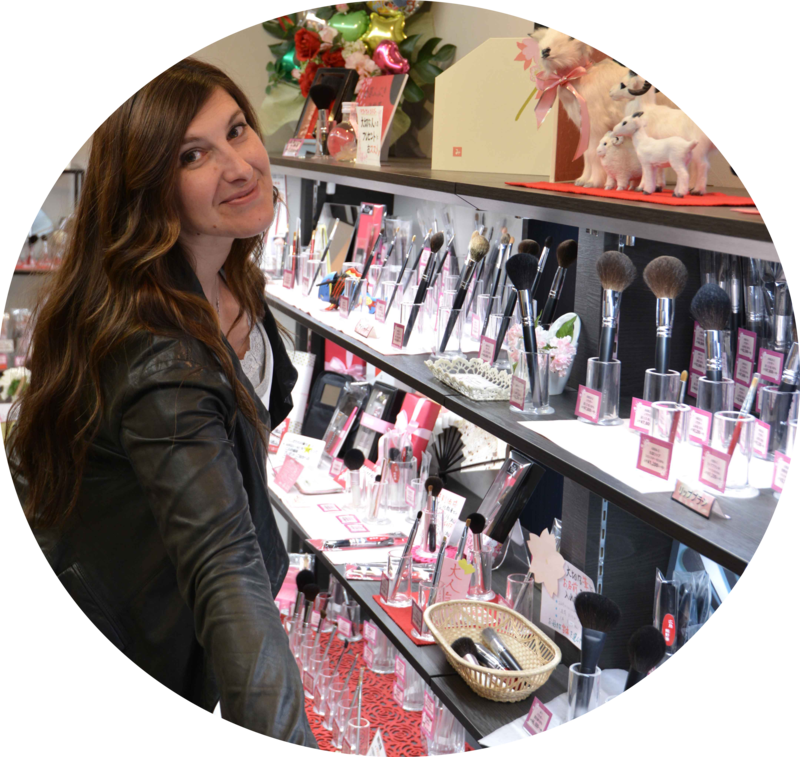 Some other brands use Rose Gold ferrules, for example Zoeva, some Hakuhodo Limited Edition and the Charlotte Tilbury. There are certainly others but these are the ones I had in my drawers to show you. WAYNE GOSS AIR-BRUSH IN ROSE GOLD was last modified: December 16th, 2017 by Sonia G.
Superb review, as always. Thank you. Hi, I have the first version and though I like the air brush for undereye powdering, I prefer his n°2 blush brush for just about everything in comparison with this one. I have two n°2 for this reason. 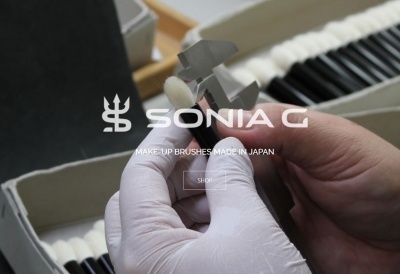 I also agree with you that the rose gold ferrules, though I like the color), don’t quite do anything for me. Solid color, darker colored brushes appeal to me more. 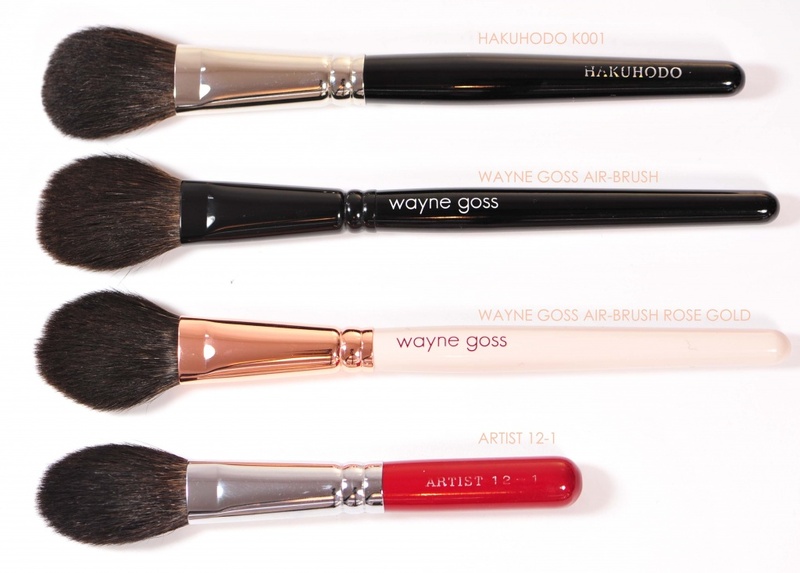 For example, the blue Real Techniques series (which I don’t own because I’m just no a fan of their brushes, only one or two) would really call to me if I had Wayne’s or higher quality.